Watch out tankers! This new armor-piercing weapon could spell trouble for your tracked vehicles. China recently revealed the world’s most powerful armor-piercing 120mm/125mm canon Jeffrey Lin and P.W. Singer report over at Popular Science. According to the 127th Ordinance Institute of the Central Northern University the cannon, in comparison to similar types of guns, displays the highest, range, velocity, and penetration power in the world. This multipurpose cannon reportedly has a muzzle velocity of 2,000m per second for armored piercing fin stabilized discarding sabot (APFSDS) rounds, whose discarding sabot concentrates the kinetic energy from propellant into frontal area of the penetrator rod, which is the size of a half dollar coin. For comparison, current Chinese 125mm APFSDS have a 1700m/s muzzle velocity, the German L55 has a muzzle velocity of 1,750m/s, and the US’s M829A3 APFSDS round has a muzzle velocity of only 1,555m (but uses a larger penetrator with increased mass to increase imparted kinetic energy). 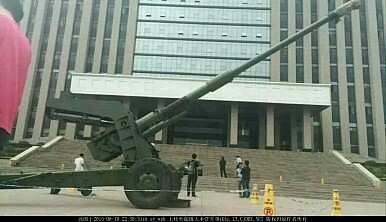 The cannon will now undergo thorough testing by the People’s Liberation Army (PLA) and could be used for the next generation of Chinese main battle tanks (the turrets of current Chinese tanks in service appear to be too small to accommodate a gun of this size), although the pictures published on the Popular Science website showed it mounted on a towed carriage. [T]he new tank cannon uses one piece ammunition, in contrast to the 125mm two piece ammunition used by current Chinese tanks such as the ZTZ-99 and ZTZ-96. The autoloader on those tanks are limited to two piece 125mm ammunition due to size restrictions, which in turn results in a smaller APFSDS rod with less kinetic energy. The new one piece 125mm ammunition will allow for larger APFSDS [Armour-piercing fin-stabilized discarding-sabot] rods, while keeping the caliber to 125mm to save weight, as opposed to scaling up to a larger caliber, such as 140mm. Lin and Singer also note that should the gun prototype turn out to be successful, it would be a good example of how the Chinese defense sector is now entering partnerships with academia when it comes to military R&D projects.